To make a big score, Korean-American Peter (Nam Sung-Jin), travels to Seoul to sell a high-priced painting. He works for the U.S. intelligence service. In Seoul, he is followed by those aware that the painting is about to be sold. 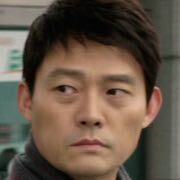 Peter is helped by a friend, Hye-Jin (Bae Jung-Hwa), and he attempts to sell the painting to novelist Ji-Yoon (Hwang Geum-Hee). She is inspired by the painting and begins to write a new novel.